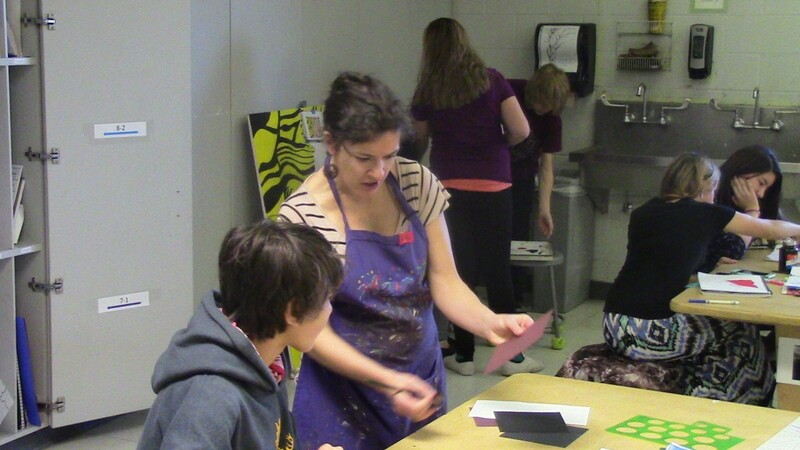 Shannon Mello is a 2011 graduate of Colorado College’s Master of Arts in Teaching, K-12 art program. She believes that during her time at CC, the student teaching component of the program is what most prepared her for her teaching career. Mello was able to attend art shows during her time student teaching, an opportunity which allowed her to truly experience the partnership between the community and arts education. “I was able to see the community art shows and the involvement in the preparation… I didn’t realize physically how much was involved. The organization, reaching out to parents, sending out letters and news information to communicate with the community; people don’t even realize how much preparation goes into [the art shows]”. Over the past five years, Mello has been teaching art at Mountain Ridge Middle School in Colorado Springs. As a teacher, she feels she has always been supported by a phenomenal staff and great administration at Mountain Ridge. In her first three years, Mello’s talents were recognized and she was honored with the Teacher of the Year award. Mello is particularly found of Mountain Ridge because as an IB school, the curriculum is very inquiry focused, much like the MAT program at CC. “It is very much reflection and process-oriented instead of being focused on the end product. Inquiry is promoted by instructors, and it breeds a safe environment”. Mellow channels an enormous amount of her energy into building relationships with her students at Mountain Ridge. “Even if it is just knowing one thing, like the events they do after school, I think building relationships is incredibly important”. During her second year teaching at the middle school, Mellow wanted to get involved with the community and started the Grizzly Gala: A Night of the Arts. The semi-annual event is a presentation of art, drama productions and musicians. It acts as a showcase and an opportunity to display student work for the enjoyment of the community. Since she began teaching, Mello’s most memorable experiences are when students tell her that she has inspired them to be art teachers. Mello’s years at Mountain Ridge have taught her to never assume where students come from. She emphasizes the importance of communicating, and trying to have them communicate as much as possible. She thinks this interaction is vital to promote a safe environment. In recent years, Mello was part of the Colorado Academic Standards in Visual Arts Committee, and really enjoyed the process of teachers teaching teachers. Despite her great experience teaching and learning from adults, she thinks she would miss the kids too much. While Mello can’t imagine working anywhere other than Mountain Ridge right now, her dream is to eventually build a new art program from scratch. This entry was posted in Alumni Profiles, Recent Posts and tagged alumni, art, cc, colorado, colorado college, colorado springs, education, Education Department, middle school, teacher, teaching by sblair. Bookmark the permalink.